Born at Limoges on February 25, 1841, Renoir died at Cagnes-sur-Mer on December 17, 1919. When he was 13, Renoir entered a Paris porcelain painter’s workshop as an apprentice and developed a fine brush technique and facility with color. At 21, he attended courses at the École des Beaux-Arts and subsequently at Glyre’s. He made friends with Cezanne, Pissarro, Sisley, Monet, Bazille, and Diaz. In 1873, the artists Durand Ruel, Caillebotte, and Duret took an interest in his work. Renoir was involved in “The Society of Painters, Engravers and Sculptors,” which was founded in 1874, and witnessed the birth of Impressionism. From there, Renoir was immersed and able to spend time with his fellow artists of the day. He did not take up original printmaking until he was 50 years old, first with two small soft-ground etchings after his painting, “The Rustic Ball,” followed by an etching of Venus for the frontispiece of Mallarme’s Pages. Most of his engravings were done after his own pictures. In 1892, he did his first lithograph – a portrait of his son Pierre. In 1894, he met Ambroise Vollard, who played an important part in the production of Renoir’s and Cezanne’s lithographs and etchings. 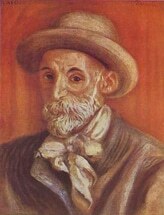 Renoir preferred lithography to engraving on copper and Vollard encouraged him to keep creating original graphic works. The results were The Pinned Hat, Twelve Lithographs (“The Vollard Suite”), Mlle. Dieterle, portraits of Cezanne, Wagner and Rodin, and likenesses of his sons Jean and Claude. Around 1912, Renoir’s rheumatism became aggravated to the point where he was forced to forego engraving and had to tie a brush to his hand so that he could paint right up to the day of his death.